Come join us this year from 12-8 for a 4th of July celebration! We will be hanging out on our new inflatables' area and having 16% off all 2016 Liquid Force gear, along with chances to win awesome prizes during our competitions. Open riding will be from 12-4 pm. We will be selling $16 all day passes that will allow you to ride for all 4 hours. Rental gear can be added for an additional $4. The inflatables will be open from 12-4 and will cost ONLY $8 for a 50 minute session. Sessions start on the hour and end 50 minutes after the hour (ex: 12:00-12:50). Competitions will start at the times listed below. Each participant will need to pay $4 to compete in the events and you can compete in as many as you would like. Teams can call ahead to sign up or wait and do that at the front desk when you arrive. Space is limited due to time constraints, so make sure you sign up early! Stick around after you ride, or jump, for a cookout and s'more roasting as well. 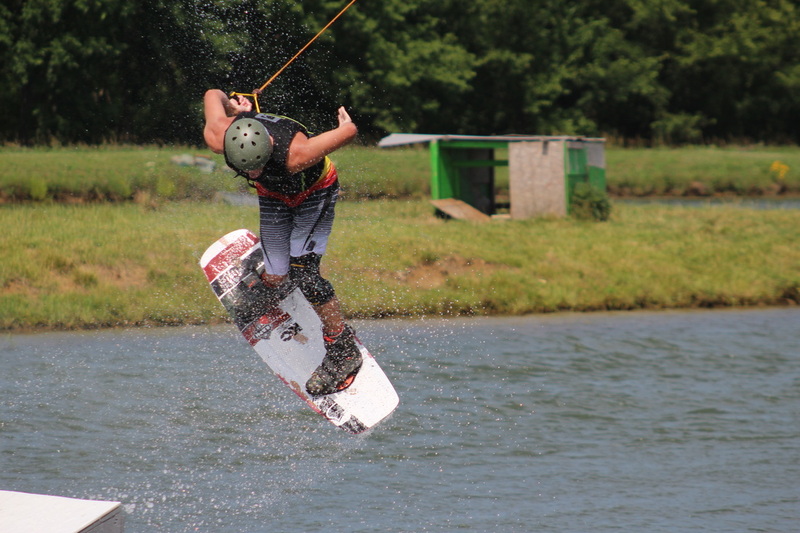 Make plans to join KC Watersports for your 4th of July this year! Team up with one friend to compete in this event. One person will stand on our beach with a football, and the other will strap in to a wakeboard and ride the cable. When the rider comes past the Mastercraft kicker, their teammate will throw them the ball, and they will score points based on how far they are from the shore. Each team gets three attempts to score as many points as possible. This event also requires a team of two. Each team member will be given a roll of duct tape and access to our mountain of cardboard boxes. You will have 15 minutes to construct a canoe, boat, board or any other type of watercraft. Once the time is up, it will be time to put your work to the test on the main cable. The vessel that makes it the furthest wins! A team of three is required to compete in this event. Using pool noodles and our two wedge kickers, you will compete in a game of human-sized ski ball. 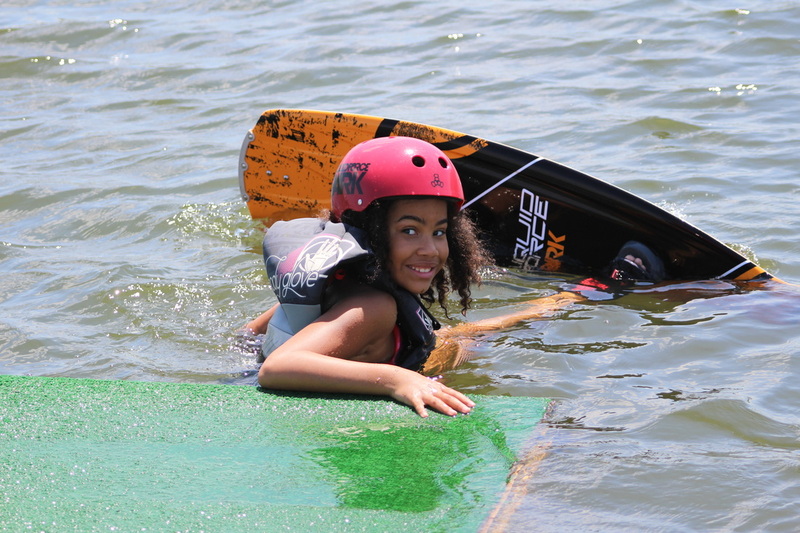 Teams will start out on the dock of our main cable lake and ride a wake skate over the kickers. They will try to launch themselves through one of the hoops placed in the water. The smaller the hoop, the more points you score. Each team member will get to go twice, and the team with the highest score wins! The final event will be a four person relay ending on the main cable. Three teammates will start out on our inflatables beach. On signal, the first teammate will race out to the inflatables, climb up and grab a pair of bindings and then return to the beach as fast as possible. They will then tag their teammate, who will swim out to the inflatables, grab a board and swim back. They will then put the board together and hand it off to their third teammate who will run it back to the starting dock where the fourth teammate will be waiting. That teammate will strap in and ride 1 lap around the cable, and stop at the beach by the Mastercraft kicker. The rider can hit features and do tricks to take seconds off of their time. The team with the fastest time wins the relay!